We were pretty impressed to see BASTILLE on the latest Band Aid track, and it's not just the likes of Bono and Bob Geldof that they've been collaborating with of late. 'Bite Down' sees them join forces with HAIM on their new 'VS. (Other People's Heartache Part III)' mixtape - check out Part I and Part II while you're here. While the previous mixtapes saw collaborations and covers of hits like Fleetwood Mac's 'Dreams' and City High's 'What Would You Do', the newest edition takes more of an original route - including 'The Driver', which appeared on the recent BBC rescoring of the Ryan Gosling-starring 'Drive'. Elsewhere there are appearances from MNEK and Angel Haze but the best track we've heard thus far is their combo with HAIM, which perfectly captures the pop sensibilities of each act. 'VS. 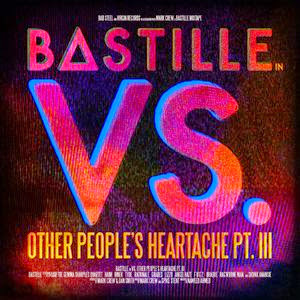 (Other People's Heartache Part III)' is out on Dec 10th. Find more info at facebook.com/bastilleuk.